We’ll be on ‘The storytelling of Science’! Catch genderbrain live on April 30th in the Museum of Applied Arts and Sciences! We’ll be telling the genderbrain story in new and interesting ways, and you can be there! We’ll be at the Powerhouse museum this Saturday! Yep 14th of November at the Powerhouse, we’ll be representing the bejesus out of Genderbrain. Come watch us battle it out with the other fabulous panelists in a celebration of science and silliness. We’ll be saying things on ‘science says’ ! 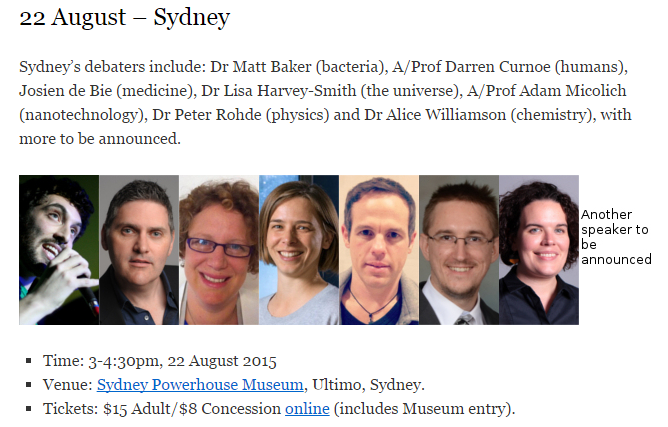 We’ve been invited to be on the panel of the ‘Science says’ event in Sydney! I had the privilege to debate some excellent scientists on a range of subjects. One was, ‘my research rules’. Easy, mine totally does! Genderbrain is in The Great debate! We’ll be at the The Science Nation‘s Great Debate! Here I will convince the audience that basically having to have ‘the talk’ over and over again with full grown researchers is certainly the weirdest field of work yet. SHARE: Please help keep our work going by sharing our site and Facebook page and following us on Twitter. NEW! : donate to our research directly!